Mere talk of concepts such as integration or accessibility is never enough. And, that's the truth, it never is. 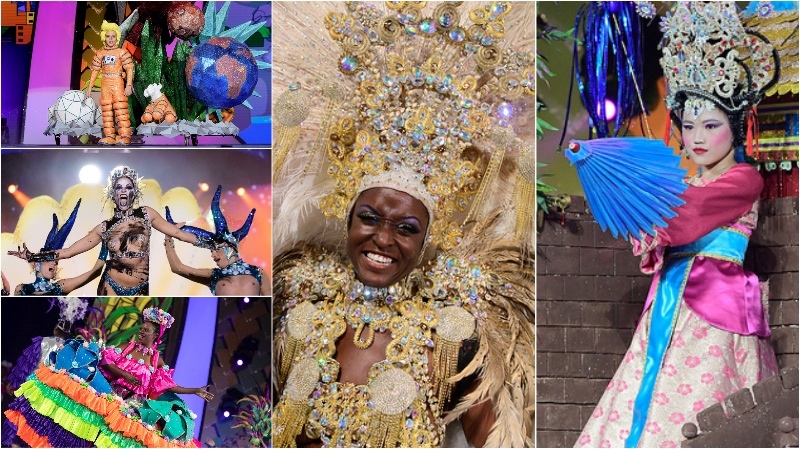 The Las Palmas de Gran Canaria Carnival took up the challenge of improvement in this aspect many years ago now: the fact is, this aspect is one of the celebration's identifying features, defending diversity in the widest possible sense, without distinction of physical or mental condition. Freedom and respect are the values of a celebration characteristic of an open city. Its largest fiesta, with nobody left out before it even starts. That is why every year the Las Palmas de Gran Canaria Carnival celebrates its own Social Integration Gala, where different associations from the island compete in their costumes, in a very emotional contest; the atmosphere is one of solidarity, of great affection... and of an indomitable festive spirit. This is why the organising team also makes sign language interpreters available at each one of the events (galas and contests) in the Parque Santa Catalina, whether they are being broadcast on live television or not. Screens show the translation, so that the Carnival can reach everyone. And everyone wants to take part: Davinia Reyes Lantigua was the candidate presented by the Las Palmas Association for the Deaf (along with Fontanales and the Moya Town Council) for the Gala for 2019 Carnival Queen. Equally emotional is the presence in recent years of Drag Trisómico, Héctor Santana: a candidate who has never been held back from participating in the Drag Queen contest by this genetic trisomy 21, which leads to the appearance of Down's Syndrome. In 2019 he didn't make it to the grand finale, after a highly contested preselection with 40 participants. Despite this, Trisómico is part of the history of the Gala, and his father is a regular backstage with his son, lending his support to this devotee of the fiesta. In that same Drag Queen Gala, gender is not a reason to exclude anyone, and the gala is traditionally associated with freedom when it comes to the expression of sexual condition. Norma Ruíz has been the only woman to take part in recent years' celebrations of the Gala, with very high quality performances. In fact, Drag Noa was the runner-up in the 2019 Drag Queen Gala, in what has been her farewell appearance in the Carnival. This year there was also another female contestant in the preselection: Esther Pérez Ramón, who had already been Carnival Queen, was the first woman to take part in both contests. In a wider sense of integration, the Carnival has also brought many participants from overseas into the fiesta, as is appropriate for a city whose history links it to Europe, Africa and America in successive waves of immigration. This diversity is plain to see in contests such as the comparsa shows... although the most outstanding example in 2019 has been that of the Carnival Queen, Erika Echuaca Sebe, who comes from a family which emigrated to the Canaries. In this effort to avoid any type of discrimination, the Carnival organisers have also modified the rules for its Children's Gala, and this year a boy has competed for the first time with the rest of the female candidates: Xavier Romero Rivero, who in fact won a prize, as the contest's Master of Honour, alongside the other three Maids of Honour. These are only a few examples of the true feeling behind this fiesta, and its spirit of freedom and integration. The Las Palmas de Gran Canaria Carnival makes every effort to ensure that everyone, without exclusion, feels part of the fiesta.